Semi-desert, foothills. Open shrub and grasslands. Spring, summer. There are a number of varieties of Opuntia phaeacantha; all commonly grow three to five feet tall and wide, but in the Four Corners area they are most commonly ground hugging and sprawling. 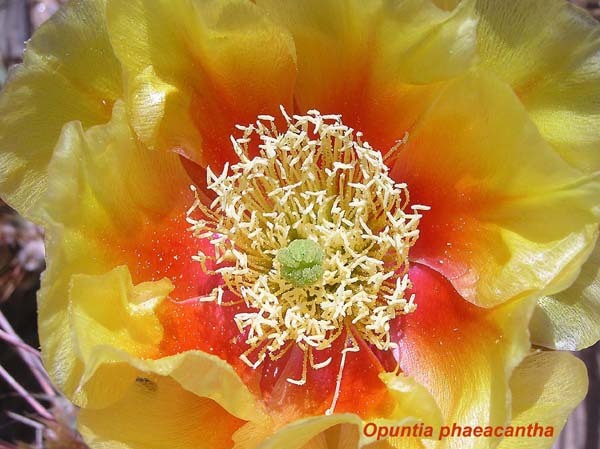 Opuntia phaeacantha has pads that range from three to ten inches, spines that are widely spaced and brown tipped, and, most often, yellow flower petals with red-to-orange tinting at the base. Flowers can also be shades of pink. It is common to find Opuntia phaeacantha pads that have semi-circular chunks missing from them -- usually the work of deer. The smaller nibbles are taken by squirrels, chipmunks, and mice and the missing fruit has often disappeared into collecting bags of humans who relish it for pies, jams, and muffins. The name "Opuntia" was used by Theophrastus for a plant, not in the Cactus Family, which grew near the Greek town of Opus. Somehow "Opuntia" was centuries later applied to this genus of Cacti. "Phaeacantha" is Greek for "dusky thorn" referring to the brown tipped spines.